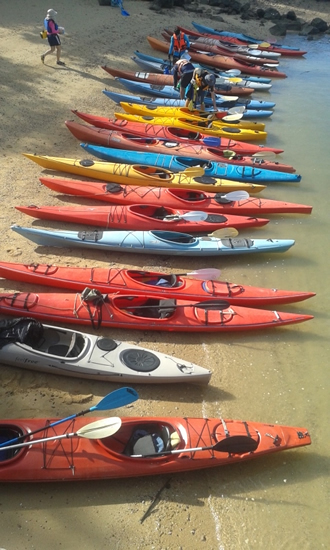 Sea Kayaking Thailand in Phuket is the only company in southern Thailand with a large fleet of proper traditional touring sea kayaks. With a traditional touring kayak, the paddler is an intimate part of the boat. The paddler’s feet are resting on footrest and his/her knees are pressed against “thigh braces”. Modern kayaks have very comfortable seats. To customize the seat and to gain more control, many paddlers attach hip pads to the sides of the seat. This increases the control, it’s something that cannot be done with an inflatable and it would be very difficult with a sit-on-top. Some sit-on-top boats have a thigh strap option. This is still not as secure as a rigid deck to brace against. One of the most important kayak techniques is bracing. Bracing is a maneuver used to prevent capsizing. A strong brace is one of the hallmarks of a good paddler. It is almost impossible to perform a proper brace in an inflatable. The flat-bottomed design makes inflatables very stable, but once the boat is tipped over too far, it simply capsized. A more rounded hull, like those of the majority of sea kayaks, allows the paddler to recover stability with a brace. Leaning is also a sign of an experienced paddler. It is used to enhance a turn or to surf sideways on a wave. Sit-on-top paddlers could do a brace only if they have thigh straps. Most popular brands of sit-on-tops are plastic and feature very weak plastic cleats as attachment points for the thigh straps. They often pop out… usually resulting in a capsize. The key to understanding why sea kayaks are a better choice for anything except the above situations is the efficient use of energy. In a given period of time, a person will take a certain number of strokes, requiring a certain amount of energy output. When paddling either an inflatable or a sit-on-top, the expenditure of energy produces limited progress. 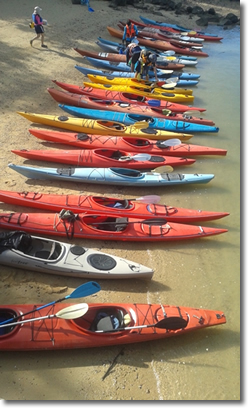 Neither craft is well-suited to distance paddling or ocean conditions. When paddling a traditional sea kayak, the entire design and construction of the boat is aimed at maximizing energy efficiency. There is a joy in being in a long, sleek, efficient kayak that reaches back in time to the very early days of kayak development and use in Alaska. The pleasure of exploring the rocky coast or headland of a lovely island is best experienced not in a noisy longtail boat, nor a fast powerboat, not even in a yacht. To be near the rocks, watching sea birds and crabs, looking down at coral and fish; this celebration of tropical ocean touring is best done under one's own power, in a fast, maneuverable, stable sit-inside sea kayak.